Well he was an above average baseball player from 1986 to 2001. That was a pretty long career of 15 years and during that career he batted .280 with 287 hrs and almost 1200 RBI. Like I said he was a pretty good baseball player. So what makes him special? His ability to delay gratification! 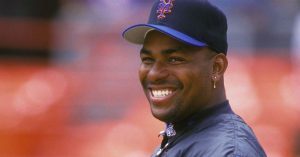 You see in 2000 the New York Mets were looking to dump Bonilla’s $5.9 million contract and instead of getting it in a lump sum his agent suggested that they delay the payment and take it over a longer period of time. Crazy right? Who says don’t pay me now I can wait. Well he looks like the genius now because on every July 1 beginning in 2011 all the way until 2036 Bobby Bonilla receives a check for $1.19 million dollars. The 25 years of checks will be worth $29.75 million dollars to him. If he had taken the $5.9 million-dollar payment it would be worth $13,406,204 dollars in 2036 when compounded at 2.3% for inflation. That’s ignoring taxes and agent fees. Of course, he could have taken that $5.9 million-dollar contract and invested it and maybe grew it to more than $30M by 2036 but if history is a guide he probably would have lost some of it in the dot.com bubble in 2000 to 2002, or the housing bubble in 07-09, or the Great Recession. So, he may be a hero. He delayed gratification and he is definitely looking like a winner in this scenario. So, what does Bobby Bonilla have to do with retirement planning. He chose to put his money away. I know none of us are fortunate enough to be paid millions of dollars a year to play a game, but we can all put away a few thousand a year to get started. Delayed gratification is one of the hardest disciplines to tame. Take the Bobby Bonilla approach and put as much of your salary away as you can for 20 to 30 years from now. You will need it. If you need help figuring out the best place to put your hard earned money give us a call to schedule a time to talk 336-310-4233 or send me an email at phuminski@thoriumwealth.com. As a bonus if you want to understand why the Mets would defer his salary like this read my piece about Madoff and the Mets.